This image provides an aerial view looking northeast from the Guild’s Lake Pumping Station. 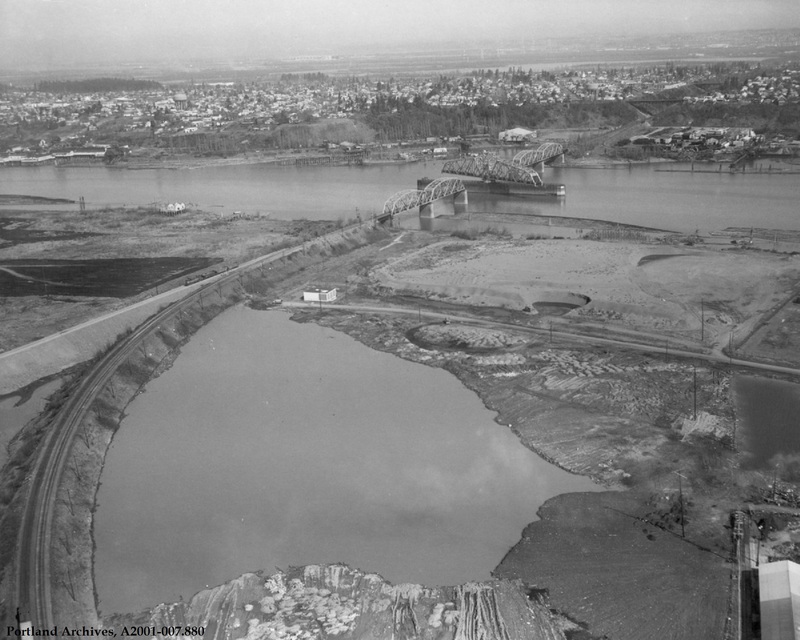 The railroad bridge, the “cut,” Doane Lake, and St. Johns are visible. Also visible along Willamette Blvd. are the Water Bureau’s Alma and St. Johns Water tanks. 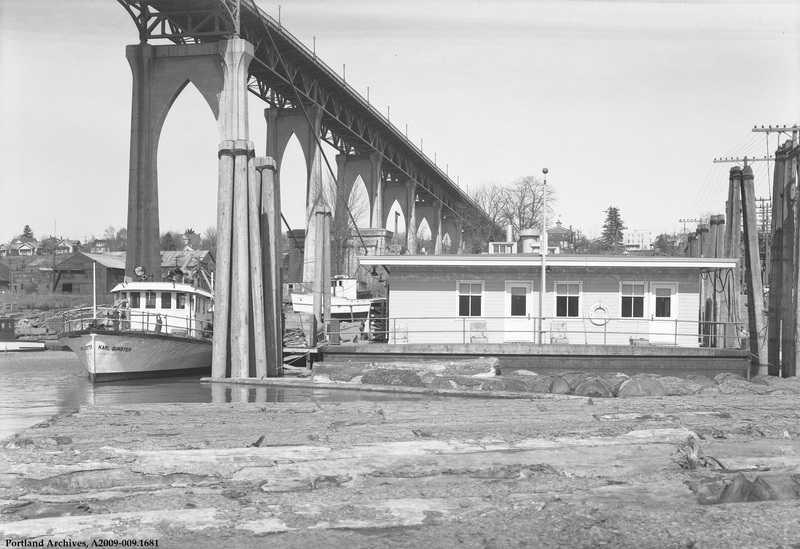 Here we have an excellent view of the floating Fireboat 3 Station when it was located at the St. Johns Bridge. In this view, we are looking northeast, towards St. Johns. 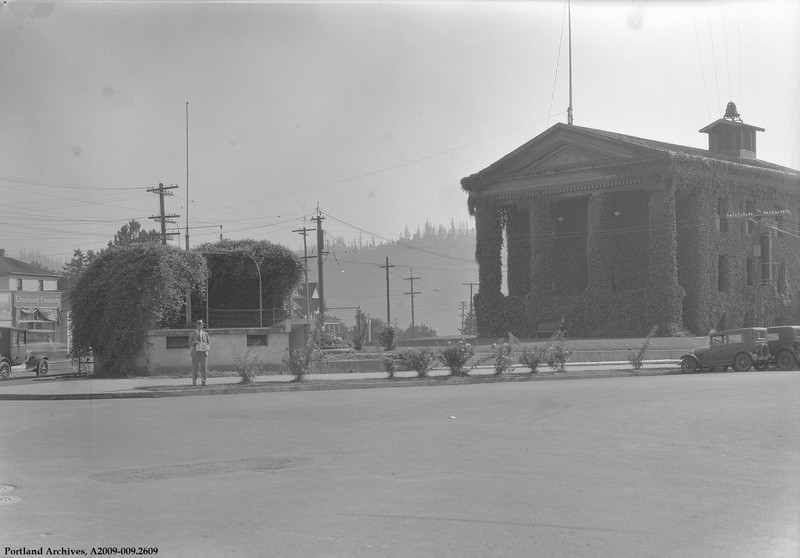 In the background you can see the building that is now the Portland Police Bureau: Training Division building. Three identical fireboats, built in the late 1920s, were located near the Hawthorne Bridge (Fireboat 1, Mike Laudenklos), in lower Albina (Fireboat 2, David Campbell) and in various locations in St. Johns area (Fireboat 3, Karl Gunster). 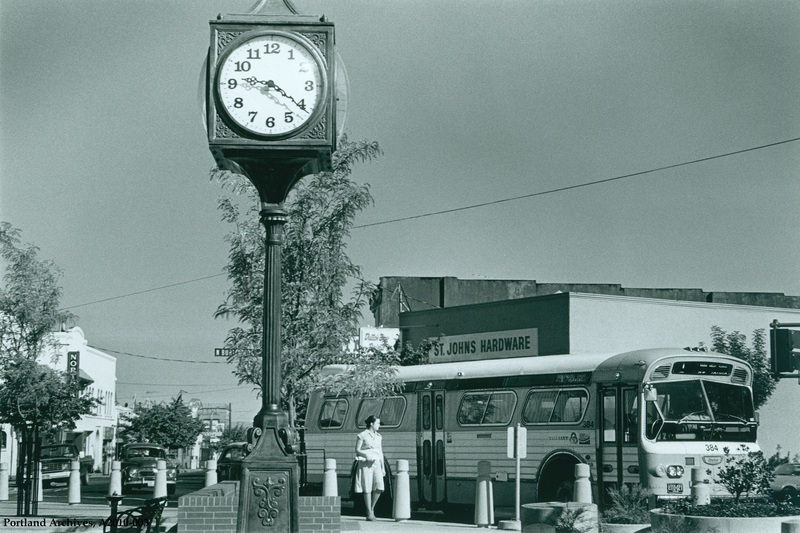 The David Campbell is still active today as a reserve fireboat and is located at Station 6 in Northwest Portland near Front Ave. 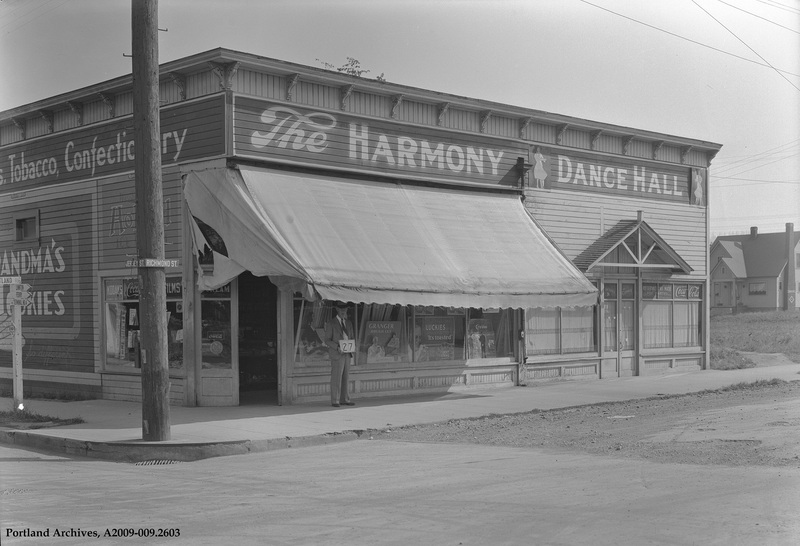 This classic 1932 photo shows a long-gone slice of Americana. 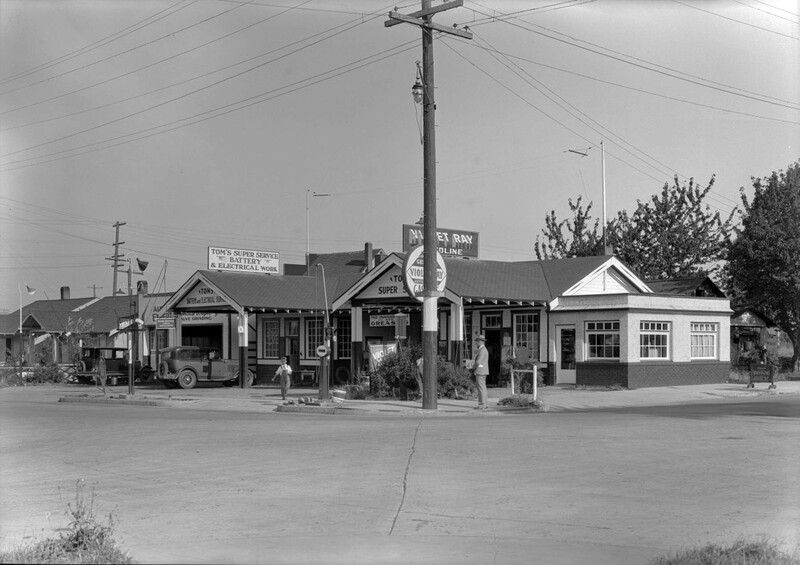 Tom ran a tidy gasoline and automotive service station on the corner of N. Ivanhoe and St. Louis Avenue in St. Johns, but our Number Man had some kind of plans for the future of this corner. One could almost imagine tumbleweeds blowing down an old west street but it’s actually the corner of N. Ivanhoe Street and Chicago Avenue in St. Johns. 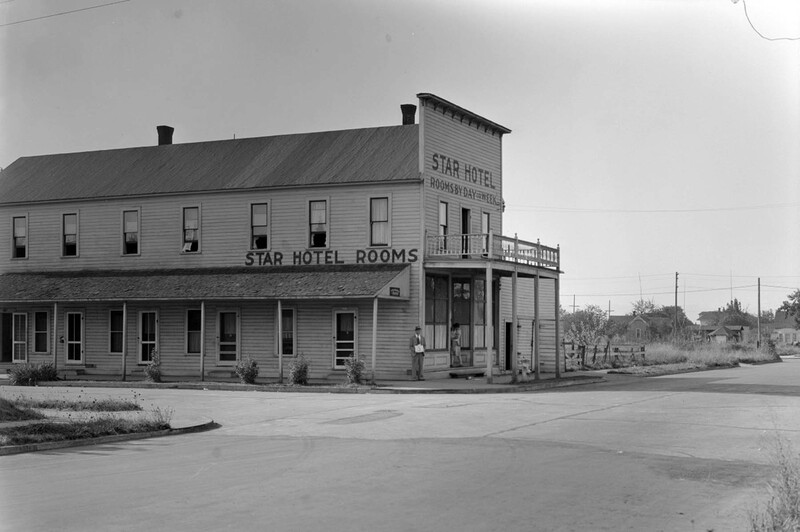 The Star Hotel, a rather rough-looking establishment, fronted on Ivanhoe which goes off to the right in this circa 1932 photo.